This deliciously hearty & creamy lunch or dinner bowl will take you less than 10minutes! can you believe it? I mean, talk about a super speedy gonzalez meal! Perfect for a busy and rushed day, because you still get to take care of your body and eat right. This is great as a to-go lunch too! just keep it in the fridge at work and you're all set. 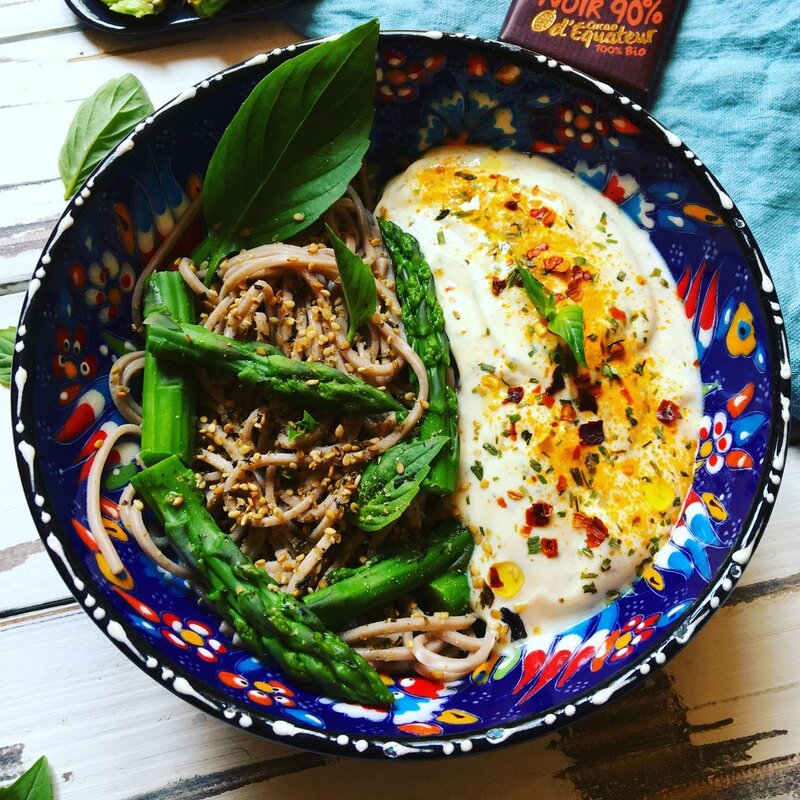 This recipe is plant-based, vegan, and gluten free if you used gluten free soba noodles. Give this bowl your love, and it'll give it right back to you. You'll feel on top of the world after enjoying this light and yet creamy rich bowl. CAREFUL! when you place the soba noodles, usually a white foam will form and build up. You need to blow on it continuously to prevent it from spilling everywhere, and/or place a wooden spoon on top of the pot to keep the foam from going overboard. Keep a good eye on your pot, don't just throw in your soba noodles and leave them. NOTE: you could substitute the soba noodles for rice noodles, which instead you dip in cold water on the side for 10minutes as you bring your water to boil, and then once the water in boiling you add the rice noodles for 5 minutes. Mix the soy yogurt, cumin, turmeric, chives, olive oil, salt, black pepper, chilli and fresh parsley. You can also add a touch of lemon juice and orange zest for a tangy note. Enjoy this meal by dipping the noodles into your sauce and slip away! Thank you for reading and cooking with me!